Bringing a new baby home from the hospital and welcoming them into your home is a momentous occasion. From that moment on your world is filled with firsts. The first time your baby smiles back at you. The first tiny yawn. The first successful tummy time. The first time he or she sleeps through the night. So many cute, tiny, wiggly, giggly firsts that make us hold our breath so time stands still. There’s another kind of first that can also take your breath away. The first time your baby discovers the outlets on the wall. The first time they reach up and touch the door handle. The first time they pull all the pots and pans out of the cabinet. It’s hard to get mad at someone so cute, but teaching your baby what’s safe and what’s not is important. 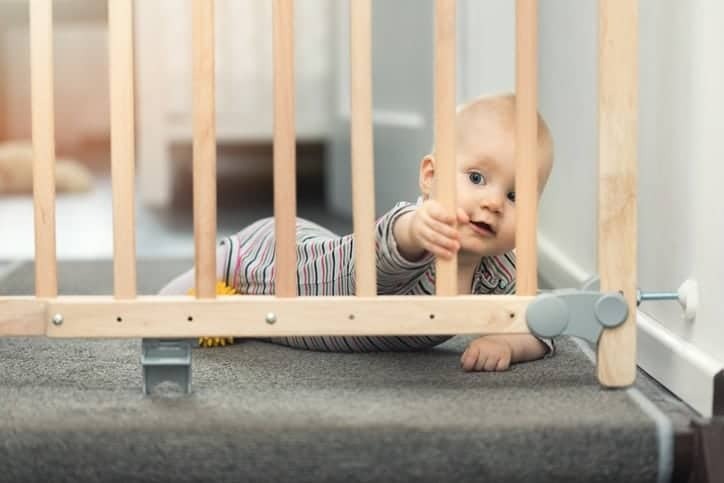 Preventing accidents and protecting your kids starts with childproofing your home and creating boundaries. Luckily, there are so many products that make it easy for parents to childproof a home. The first step to childproofing is to cover all the outlets in your home. We’re a fan of these flat-faced outlet plugs. If you have an outlet that’s always in use, consider installing a plastic box cover or power strip cover. That way you can still use the plug, but your kids won’t be able to pull out the chord. After you’ve covered the outlets, start childproofing the rest of the home by going room by room. There’s so much fun to be had with your kids in the living room, like playing with toys, watching movies, and reading stories. Make sure the room is safe too. When childproofing your home, one of the easiest ways to spot safety hazards is to get down to your child’s level. Sit on the floor and look around. What can your child reach that could be dangerous? Seeing your home through your child’s eyes will open your own eyes to things that could lead to an accident. While we have personal experience with childproofing our own homes, it’s always a good idea to consult an expert. We recommend researching and seeking advice from your child’s doctor if you have additional concerns. One thing we are experts in: Building beautiful craft homes with the personal care of family. At Porchlight Homes, we bring your dream home to life with thoughtful craftsmanship and a genuine touch. For more information about our communities, reach out to us online or stop by for a tour.